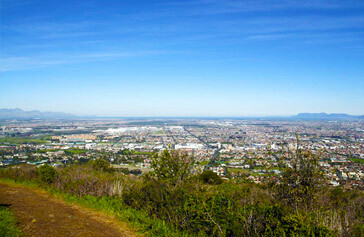 Situated in the northern suburbs of Cape Town, Tygerberg Nature Reserve offers a magnificent view from the hilltop with a 360° panorama of the City. It is also one of the few viewpoints in the City from where we can get a view of two World Heritage Sites, namely Robben Island and Table Mountain. The False Bay coastline is also visible on a clear day. Spreading over 388 hectares, Tygerberg Nature Reserve is recognised as the “green lung” for the city of Cape Town, and is as well the ecological corridor for animals with large home ranges. The Tygerberg Nature Reserve represents one of the last enclaves of the highly endangered Swartland Shale Renosterveld. In fact, almost 562 flora species have been recorded here, 23 of which are endangered. 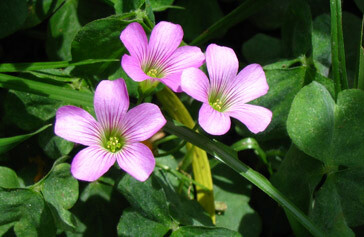 Eight plant types are endemic to Cape Town and three species are indigenous to the Tygerberg hills. “Heuweltjies”, which are circles of different vegetation created by termites, give the hills a spotted appearance. In spring, the vegetation changes from a dull grey colour to show off its abundance of incredible annual flowers such as daisies, Oxalis species as well as the multiple bulb species such as Lachenalia and Gladiolus. The shrub component is dominated by renosterbos, wild rosemary and wild olive. Visit the Tygerberg Nature Reserve in spring and you will be rewarded with an abundance of flowers! Fauna species are numerous in Tugerberg Nature Reserve, with 24 mammals, 137 bird species, 22 reptiles, 6 types of frog and 33 different types of butterfly. This is significant as it shows that ecological corridors are still available through and around the Tygerberg Nature Reserve and that these areas can cater to the needs of species with large home ranges, such as the honey badger. Also, after almost 100 years, the bontebk was once again able to roam freely in the Tygerberg Nature Reserve due to conservation efforts. There are approximately 13 km of trails through the Tygerberg Nature Reserve ranging from short to longer routes stretching throughout of the nature reserve. There are 2 entrances to the Tygerberg Nature Reserve: Plattekloof and Welgemoed and most hiking trails start from the latter. There is also a wheelchair trail that runs from the picnic area. All the trails are well marked and join up and intersect with one another. Just pick up a map at the office when you reach and choose whichever trail you want. Numerous attractions attract visitors to the Tygerberg Nature Reserve: rich flora and fauna, bird-watching, hiking trails, picnic areas and a 360-degree view of the city of Cape Town. The Kristo Pienaar Environmental Education Centre at the Tygerberg Nature Reserve is a popular and well-run venue. It contains a resource centre with a library and a herbarium. Lessons on a variety of topics are offered, including geography, town planning and ecology. Times are applicable to the Welgemoed gate only. 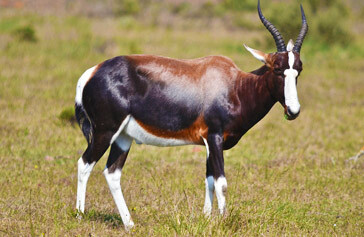 The Plattekloof gate is only open on week days from 07h30 to 16h00, excluding public holidays.